Sports nut. Too much sport is never enough. 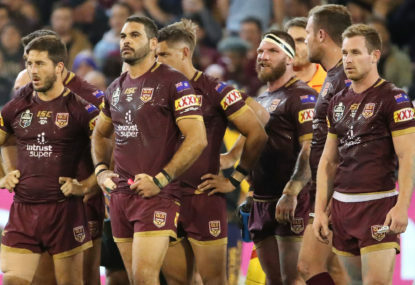 It has been a year Maroons supporters would rather forget, with their Origin team thudding back to earth after a series loss. 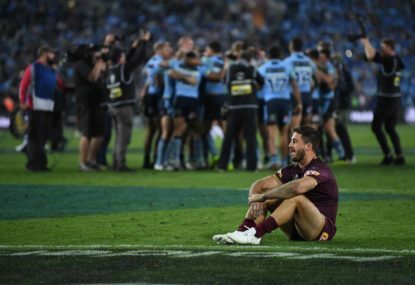 You’ve got to feel sorry for Ben Hunt. The bloke made one bad grubber kick with about five minutes to go in Game 2 and he’s been demoted to the bench for Queensland. 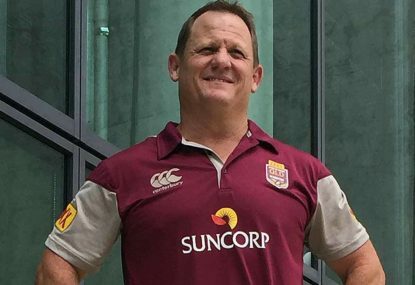 With the series over for 2018, what will the Queenslander selectors come up with to get a result in Game 3? There have been 113 games played between New South Wales and Queensland in State of Origin. Queensland have won 60, and NSW have now won 53 after Sunday night’s terrific win. 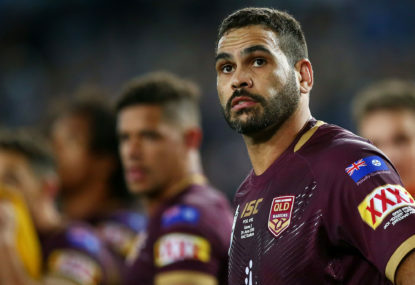 A lot of people are talking about how well Greg Inglis played in State of Origin, rabbiting on about what an inspirational captain he was. 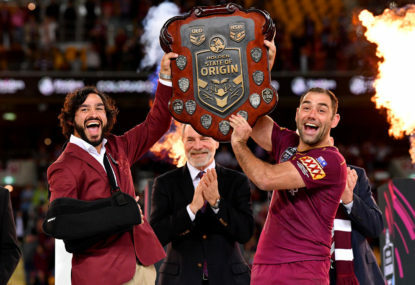 So what’s going to happen with the whistle for the first State of Origin on Wednesday night? The greatest three games of any football code in the world are about to kick off. 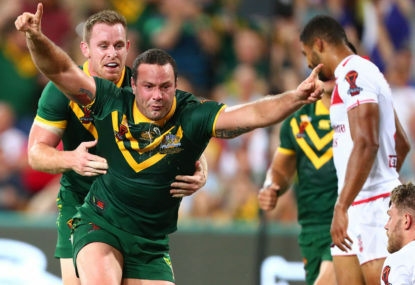 Nothing beats State of Origin for intensity, brutal physicality, and edge-of-the-seat, pulsating, pulverising excitement. I can’t wait for the Blues to get stuck into the Maroons. 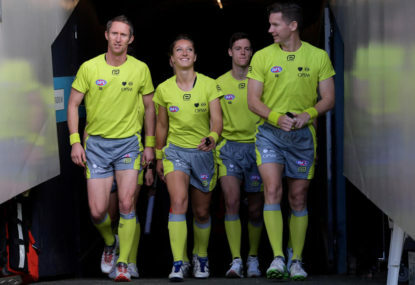 With the AFL industry getting bigger every year, it’s time to think about having full-time umpires. ‘The premiership quarter’ refers to the bizarre notion that, somehow, the third quarter of an AFL game is more important than any other quarter. I have no idea where it originated, but the sooner it goes back to where it came from, the better. After 23 rounds of the most thrilling AFL home-and-away season in yonks, this year’s finals series is shaping up as a ripper. Should we just accept bad boy Bernie for who he is? 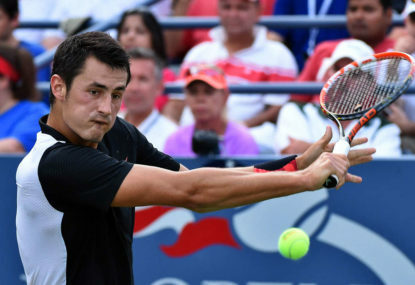 Sure, we all know young Bernard Tomic is prone to the odd brain explosion, but for all his double-faults, Bernard Tomic is a bloke that does things very much his way, and we should all respect that. Make no mistake, All Blacks coach Steve Hansen and his coaching staff will be feeling nervous about playing the Wallabies in the Rugby World Cup final at Twickenham this weekend. Very nervous indeed. I’ll be upfront with you. I’m a mad NSW supporter, even though I live in Tassie. This morning I feel like Laurie Daley, who said about 100 times in his post-match interview that ‘I didn’t see that one coming’. Can someone tell me what the Sydney Swans have done wrong? The AFL is going out of their way to make life very difficult for the Sydney Swans. The AFL is in denial. The game is being taken away from the fans, and the clubs are putting themselves ahead of the game itself. How did the Sydney Swans pull off the most controversial and audacious AFL signing in the history of the game? It was a coup of the highest order, a deal as breathtaking as it was blindsiding. Here I am Nat. I think you mean Michael Ennis, not Innis. When Inglis talks, the team listens? What was he talking about, how to lose the first game at State of Origin? Matt, The Valentine Holmes intercept should have been pulled up because the QLD inside backs were standing way offside. Take a look at the reply. So there’s six points they shouldn’t have been awarded for a start. Qld weren’t dominating the middle in the second half. That’s rubbish. QLD were looking tired and out on their feet. Next game I hope the game is refereed more like an NRL game, which I know Kevvy Walters and his coaching staff don’t want to happen. Why? Because the QLD side is too old, too slow. Mathew, there were only 5 penalties for the entire match. 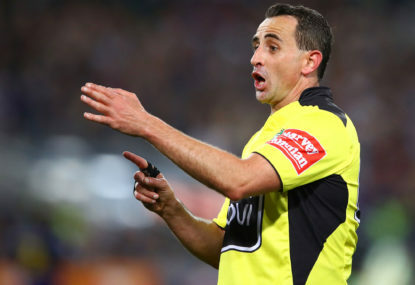 If they’d have been refereeing the game like the NRL games this year, which average 17 penalties per game, the scoreline would have been a bigger blow out to NSW. Good one Cam…Think you’ve gone a bit early on your call of the Bulldogs season. Who else would you write off for the season on the back of one game? What’s wrong with Muscat? He has done very well as a coach, he knows the players, he’s well respected by outgoing coach Ange, and he has a similar attacking style as a coach. Be great to have an Aussie in charge at World Cup. Who are the contenders to replace Ange Postecoglou? Here’s the harsh truth Harry, which must be difficult for you to handle; Buddy has been a huge success for Sydney. Measuring everything by premiership success alone is a very limited way to assess the performance of a football club over a period of time. The article explains some of the obvious impacts that Buddy has had on and off the field. Three All Australians, two Coleman medals, one GF, countless finals appearances. Sydney has done remarkably well off the field as well during the Buddy Franklin era. Look at the membership base since he’s arrived, the sponsors, and the merchandise sold. Sounds like you’re one of these toxic trolls out there who just like to be contrary for the sake of it. In fact, based on your comments I think you’d struggle to understand the rules of AFL. 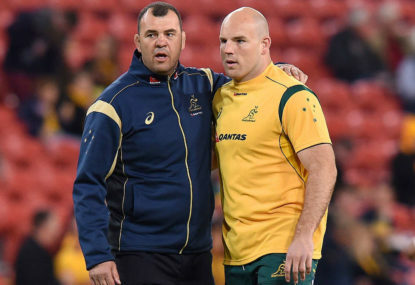 Cheika always comes across a bad loser…needs to stop with the carry on. I think Australia will give a good account of themselves at the next World Cup. some pretty formidable teams, even if they were classed as friendlies. I think the players believe in the way he wants them to play. deeper into their pockets to keep him on board. Matt Renshaw won’t ever make it back to the Australian side in my opinion, unless he changes his surname to Marsh. It’s a truly sad reflection on the current mindset of the selectors, more than the players available in my opinion. Shaun Marsh has been given every opportunity, and more, to hold down a permanent spot. (and he simply hasn’t performed well enough consistently). If the selectors continue to pick older blokes like Shaun Marsh then what’s it say to the young up and coming batters across the country. It’s just plain dumb. If Wade and Neville were playing well, then this type of selection would not happen. 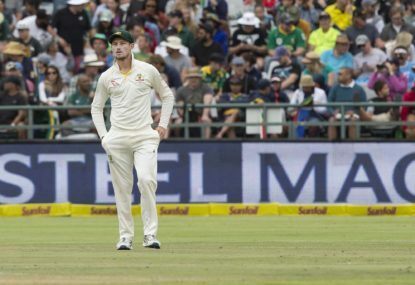 It may have come from left field, but that’s only because the blokes who have been on the field playing for Australia were not playing well enough. I’ll back Paine to hold down his spot for the series against England. Think we need to mix it up and change the order. Lyon. (He can hold down an end). Khawaja. (great Shield player, not so good at Test level). Renshaw. (he’s gone off the boil, maybe he could bowl). I think Robbie Slater and Harry Kewell will make a difference in the return leg. Nice work Peeko. I agree….I think he’s carrying on like a pork chop. Maybe he needs some post-traumatic Kangaroo disappointment counselling. The column that never was – what if Adelaide won? Head says Crows. Heart says Tigers. Heavier heart, says I wish It was Swans!! it’s an interesting debate, and the views expressed reflect the grey area of this rule interpretation. There’s a couple of things that won’t help Cotchin’s case. The first thing is that I don’t see how he can be seriously going for the ball when he clenches his right hand into a fist and then braces his shoulder for impact with Shiels. Secondly, the bloke has a bit of form with strikes, albeit pretty soft. And thirdly, Shiel’s actually had delayed concussion (presumably from the hit), failed the concussion test and was ruled out for the game. I reckon he’s gone if they’re fair dinkum. WATCH: Will this high contact cost Trent Cotchin a grand final? Come on Josh. Give it a rest. You make it sound like winning a premiership is easy. There’s too many of ‘Monday’s experts’ giving a post analysis of the latest team to bow out of the AFL premiership race. These so called experts change like the wind. Any chance that Sydney has given itself for winning a premiership in recent years has been through clever, astute and sometimes ballsy recruiting, a terrific culture, and playing a hard contested brand of footy that stacks up most games. But the competition is so even. They got beaten by a better side last weekend. That’s footy. Stop pretending you’re Nostradamus and just accept that no team has a God given right to a premiership. 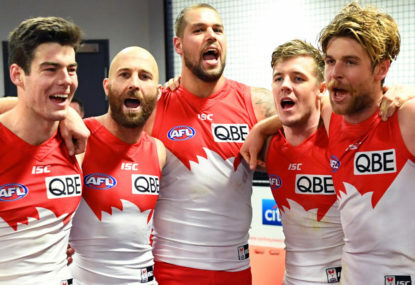 The Sydney Swans are built to win flags - so why don't they? While I should have been sleeping last night, I stayed up and watched Nick Kyrios play a tremendous match against a bloke who is seriously good on clay, as well as a very intimidating local crowd. He hung in there so well, and toughed it out, which is something I’m not used to seeing from him. Congratulations to Nick and all the Davis Cup squad for coming so close to making it through to the Davis Cup Final. I thought it was one of the best matches I’ve seen from Nick, playing on a surface he doesn’t like against a very talented player, David Goffin, who played a great match. Congrats to Belgium, but ‘super proud’ of Nick last night. What happened to the Cats who dominated September? Never give your opponent any sense that you underestimate them, otherwise they’ll use it against you. You’ll never hear an AFL coach bag the opposition, regardless of who they’re playing. It’s something the coaches in the English Premier League could learn. Interesting read. Thanks for digging bit deeper into the ‘premiership quarter’ than my article of a week or so ago. (and thanks for acknowledging the article by the way). You found sound interesting stats that I wasn’t aware of. In terms of our AFL game, even with the stats you’ve provided, and interpreted, I don’t think there’s any justification to continue using the expression, after the third quarter or any other quarter, which is essentially the point I was making. You weren’t far of the mark Josh. Give it a rest ‘ghost’. Long way to go for both these sides. But it’s pretty funny for you to carry on about grand final strike rate. 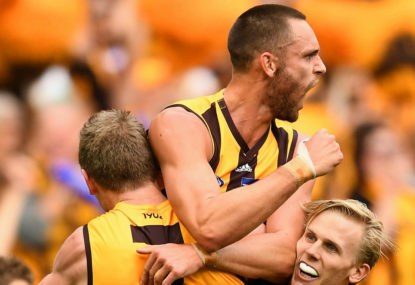 When was the last time Richmond made it to a finals campaign, let alone a Grand Final? Brian Taylor used the old ‘sold him some candy’ tonight in the Geelong v Richmond game. Nice one Brian.